This one is just hilarious. No… really. Got a Weekend WTF?! to share with the class? E-mail all photos to wtf@blackgirlsguidetoweightloss.com! Less than 2% of avocado?? 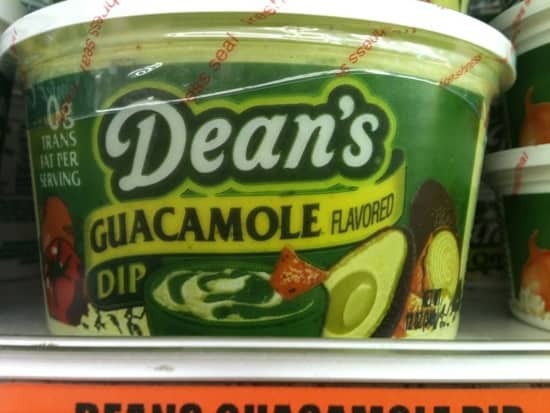 And what is “guacamole flavored”?? Oh NOOOOO!!!! I cant believe it has less than 2% avocado. 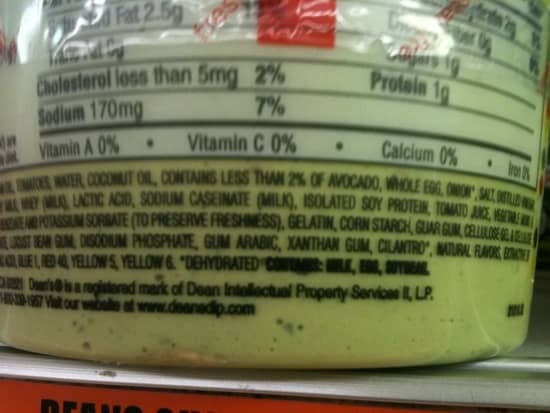 I cant make out what the first ingredient is, but it is loaded with oil and manufactured crap! Out of curiousity… how much are they charting for this? The number looks like it could be an 8… TELL ME THIS IS NOT $8!!!!!!!!!!!! Flavored!! Ewwww! Why eat that when you could have what I made for dinner last night serving size of whole wheat linguine with sauteed bell peppers, asparagus, kale, scallions, chayote, tomatoes… YAY!!!!! Out of curiosity… how much are they charting for this? The number looks like it could be an 8… TELL ME THIS IS NOT $8!!!!!!!!!!!! Made of COCONUT? Gots to be more careful..! Bwahahaha! I think that’s $3.19. Right. A flavored dip with a true hint of the flavor. Go fresh!! i make my own guac quite frequently and its not hard at all.. i see this “guac” flavored canister all the time… smh..
3. Less than 2% avocado??!! 4. When I make REAL guacamole, it doesn’t carry 2.5g of saturated fat per serving… neither is there that much sodium in there. seeing that it has only 2% of real advocado, i wonder how it’s even allowed to be called guacamole to begin with. 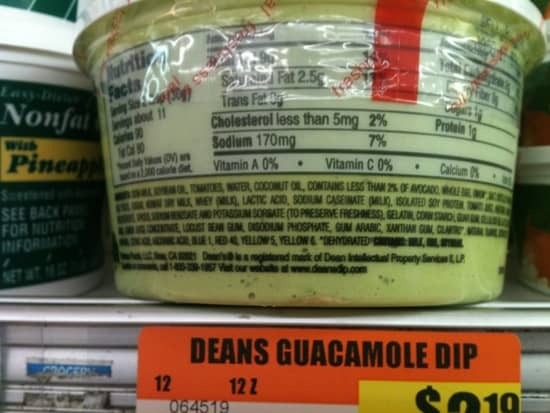 you can make real guacamole for less money I’m sure…. Now you know they wrong for this…..smdh! !